By Scott Gilfoid: HBO and Top Rank would like to see WBO lightweight champion Ricky Burns (36-2, 11 KO’s) to face his #1 WBO challenger Terence Crawford (21-0, 16 KO’s) if Burns gets past his fight next month on September 7th against #6 WBO Raymundo Beltran (28-6, 17 KO’s) at the Scottish Exhibition Centre, in Glasgow, Scotland, United Kingdom. However, Hearn is cool to the idea of Burns fighting the unbeaten and highly hyped Crawford, and Hearn doesn’t see Burns vs. Crawford as a big fight. 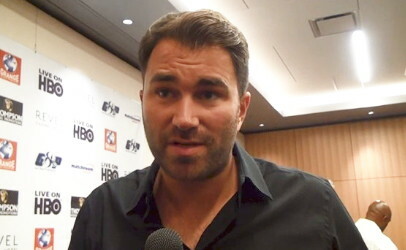 Instead, Hearn would rather have Burns fight one of the lightweight champions Miguel Vazquez, Richard Abril and the eventual WBC lightweight champion when and if the current WBC lightweight champion Adrien Broner gives up his title. That doesn’t seem like Hearn wants to match Burns against Crawford, does it? He’s going to have to do it sooner or later because Burns is facing Beltran in an optional title defense next month. Sure, Hearn can match Burns up with a unification match, but he can’t skip Burn’s mandatory challenger Crawford by having unification match after unification match. I know the WBO will let Burns bypass Crawford once for a unification bout, but it can’t go on year after year. We already saw Burns choose not to fight Adrien Broner when he was Burns’ #1 WBO mandatory challenger when Burns was the WBO super featherweight champion. Are we about to see history repeating itself with Burns facing a challenger that will likely totally dominate him with Burns opting not to face him? I don’t know what Hearn is thinking about when he calls the unification matches against the lightweight champions Miguel Vazquez and Richard Abril as being big fights. Those aren’t bigger fights than the Crawford fight. Abril doesn’t have a huge following worldwide, and definitely not in the United States. The same goes for Vazquez. Those fights are more like regular title defenses for Burns than anything close to being a big fight. I don’t buy what Hearn is saying about the Abril and Vazquez fights as being big fights for Burns. I see those fights as foxholes for Burns to sit in and avoid what would likely be a crushing one-sided loss to Crawford that would be similar to the drubbing that Nathan Cleverly took against Sergey Kovalev.